Lying nearby, 20-year-old Katty listens in silence. The trauma of the past day weighs as heavily upon her as the concrete slab she’s trapped beneath. Bodies are sprawled next to her, crushed beneath the bookstore’s roof. Later she’d learn the earthquake was so powerful it was felt hundreds of kilometres away in Colombia and Peru. Saturday 16 April 2016 began like any other day for Katty. She was in her first week of a new job at a popular book and stationery store in downtown Manta, a port city in Manabi on Ecuador’s coast. Wanting to prove her value as an employee, Katty often worked late into the night. “I was sweeping with another employee when suddenly we felt the shaking.” Around her, customers began screaming as the foundations rumbled and the ground shifted beneath them. “We started running but we only got as far as the cash register because people were blocking the way. All of a sudden everything fell and we were crushed,” says Katty. The chaos and screams were muffled. Katty found herself lying on the ground, miraculously unhurt, but pinned beneath a concrete beam. Straining her eyes in the darkness, unable to move, she had to force back feelings of panic and claustrophobia. To her relief, Katty heard the voice of her friend and co-worker Rebeca next to her. Hands tugged at her legs as Rebeca worked to release them from the rubble. There was one last pull, then relief as her legs were freed. With her new mobility, Katty and Rebeca began exploring the darkness with their hands, trying to find anything that could be useful. Her hands caught on the unfamiliar shapes of rubble and concrete blocks before her fingers closed on the cold surface of a mobile phone. Eagerly, she clicked it on. The phone lit up the darkness, illuminating the horror surrounding her. Two bodies lay next to her, a man and a woman. Survivors began to cry out, screaming in pain and desperation. Some were seriously injured. It was 12:30am on Sunday, five and a half hours since the initial earthquake. Katty counted the voices. There were at least 25 survivors trapped in the rubble, including several children. With no phone reception and no signs of a rescue party, they were becoming increasingly desperate. The children begged for food and water. Panic took hold. The oppressive darkness felt like a tomb. In the midst of the chaos, Katty began to pray. “Dear God, don’t let harm come to me. If You want me to get out of here alive, please take care of me now the way You’ve been taking care of me.” The fact she wasn’t harmed when the building collapsed seemed to be a clear sign of divine protection for this young woman. The song calmed Katty and strengthened her resolve. Her thoughts turned to her faith. She had stopped attending church and departed from God’s path some time back. Trapped beneath tonnes of concrete, she couldn’t help wondering if this was how her life was going to end. With a start, Katty realised her friend Rebeca hadn’t spoken in a long time. “Rebeca?” she called out. “Rebeca?” There was no response. With devastating certainty, Katty realised Rebeca had passed away during the endless night. Exhausted, she fell asleep. In the early morning hours of Tuesday morning, Katty woke to someone urging her to open her eyes. Turning her head, she saw a hole in the rubble, fresh air wafting through. “They’re coming to rescue us!” she said. It was 5:20am, 57 hours since the earthquake. The Quito Fire Department saved 30 survivors from the bookstore. Katty was the last person to be pulled out alive. Sadly, 96 people were killed in the store—Rebeca was one of them. The disaster renewed Katty’s faith and changed the course of her life. She is sure God has a plan for her. 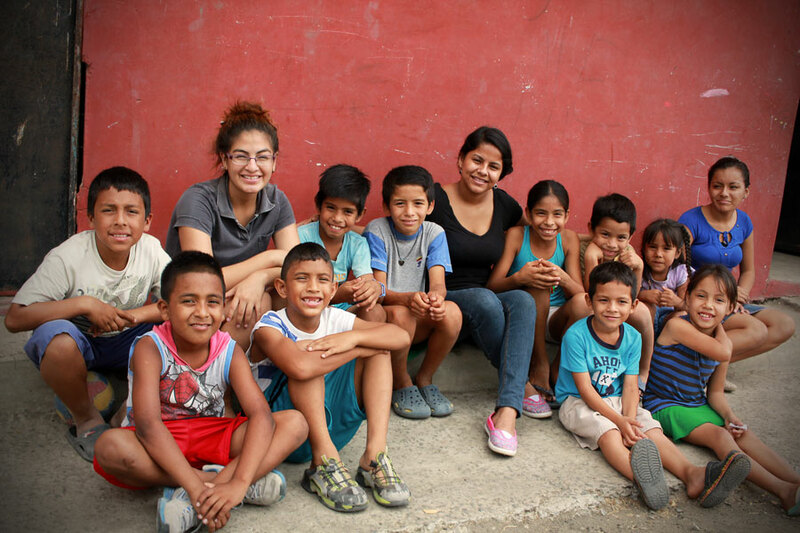 Today, she works as an assistant to the Compassion Project Facilitator in Manta. Katty’s main task at the moment is distributing aid and donations to the children and families affected by the earthquake. In the future, she’d like to attend university. When disaster strikes, local Compassion staff are often the first to respond. 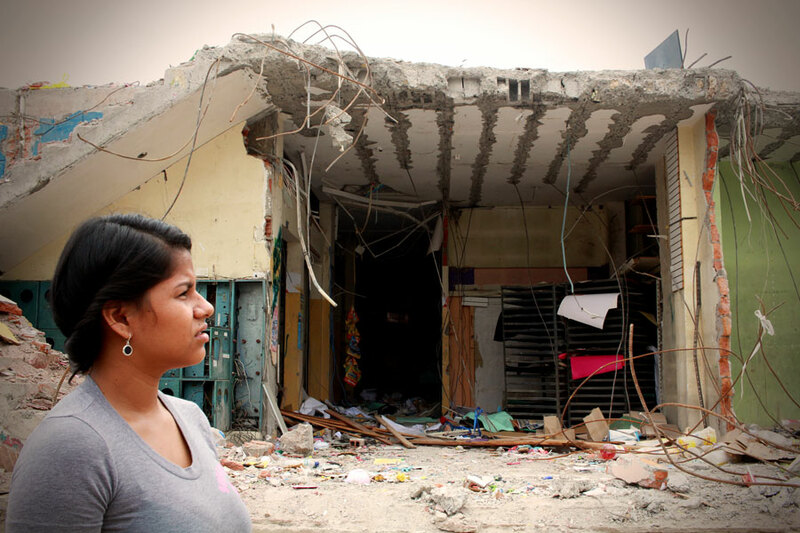 In the wake of the earthquake in Ecuador, your generous giving meant Compassion was able to provide immediate emergency relief and ongoing support to the impacted families. Find out more about how you can help Compassion protect children by responding quickly to disasters.